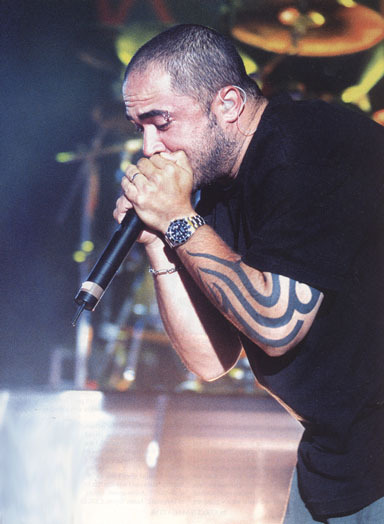 The members of Staind now realize that rock and roll careers— much like life itself— can be part of an endless cycle, So many bands get caught up in the process of touring, then recording, then touring, then recording— a much-needed cycle of renewal that is the musical equivalent, of a bountiful spring following a harsh winter. So with all that in mind, vocalist. Aaron Lewis, guitarist Mike Mushok, bassist Johnny April and drummer Jon Wyscoki had little intention of mocking that time-honored process when they titled their latest release Break The Cycle. For these Springfield, MA-based rockers, their title clearly referred more to the dismantling of some of the groups internal processes and a cleansing their musical procedures than to the destruction of rock and roll tradition. We started with a first album called Tormented and followed with one called Dysfunction," Lewis said. "By titling this one Break The Cycle we were indicating that we were finally a little more at peace with our­selves and our music. There is still a great deal of passion housed within what we do, and we're still as devoted to the band as we've ever been. But I think at least some of our questions have been answered in terms of what we're doing. That confidence is very evi­dent in these songs and they've given us the chance to start in a fresh direction in some ways while maintaining many of the qualities that the fans seemed to like about us." Like them, indeed! With their 1999 release, Dysfunction, having now sold nearly two million copies world-wide, and Break The Cyclefast-approaching the platinum sales plateau, it would seem that Staind have hit upon a magical musical formula for continu­ally entertaining the rock and roll masses. In fact, many industry pundits have proclaimed that the band's angst-filled sound— as well as Lewis' shaved-head look— have helped pro­vide shape and substance to the entire New Metal scene. Both in the studio and along the tour trail (where they've performed with the likes of Sevendust, Korn and Monster Magnet as well as their mentors Limp Bizkit), this special quartet has continually displayed an inherent feel for the rock form that few other contemporary bands can match. While some groups prance and preen in their attempts to win over a loyal and dedicated following, Staind have quickly learned to simply deliver their musical messages from their heart and from their soul. Perhaps one GIANT step would be a more appropriate means of measuring the distance that now separates Staind from the majority of their hard rocking compatriots. Maybe it is the group's ability to effortlessly shift gears from full-throttle metallic roar to plaintive, introspective purr— without losing an ounce of their rock and roll credibility— that marks them as a band that has now truly come-of-age. Unlike their past efforts, this time around Staind aren't afraid to reveal a slightly softer side of their artistic spectrum, offering songs of hope and love right along-side to anger and futility. It is this dual-sided musical personality— one honed recording studio as they struggled to complete Break The Cycle- that most pleases the ever-demanding members of Staind. With the positive critical reaction to their latest album offering now pouring in, and demand for their touring time reaching fevered proportions, the Staind patrol realize that they now perhaps stand at the summit of their career. Can things possibly get any better in terms of support from their fans and the media? Can the group possibly hope to climb even higher in the hearts and minds of their followers? Where does a band go from “up”? All these questions and more have recently flooded the band’s collective consciousness, with the only apparent answers being that there still remain many distant peaks for this talented unit to climb. It would seem as if Mushok and his bandmates have little reason for concern. With the single It’s Been Awhile already serving to expand Staind’s fan base, and other songs like Can’t Believe and Waste cementing the group’s well-deserved reputation as one of the heaviest groups on earth, it would seem as if 2001 is shaping up to be the best time of this band's six year career. But as far as Lewis is concerned, everything that Staind accom­plishes from here on in is merely a bonus to the thrill-ride he's already received. "This has already gone much farther than T ever could have imagined," he said. "I'm enjoying every second of it. What's better than being able to make music with your friends and then have so many people all over the world enjoy it with you?"